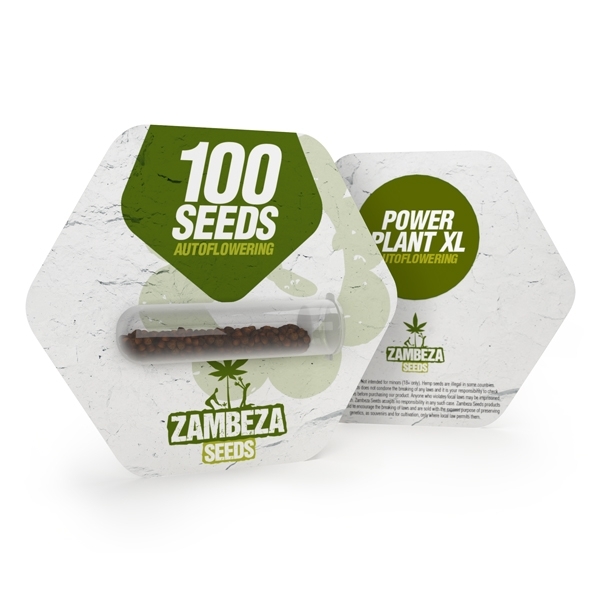 Zambeza crossed their popular Power Plant XL with a ruderalis, turning this excellent high yielder with roots in South Africa into a fabulous autoflowering variety that really everyone can grow. Indoors, she will keep at convenient heights of 60-90cm which makes Power Plant XL Auto a good choice for even smaller tents. Look forward to some good yields of up to 400g/m² when you grow her under a 600W light. Outdoors, if she gets plenty of sun she will get somewhat taller, 80-120cm with yields that can reach as much as 80g per plant. Because of her compact size, she can fit into any spot and she’ll do well if you grow her on terraces, balconies or rooftops. Her entire life-cycle, from germination to harvest is a short 55-65 days so you can look forward to some potent bud in record time. In addition to that she’s autoflowering and a fast grower, Power Plant XL Auto doesn’t grow very dense buds as some other indica-dominant strains do. This gives growers another advantage because it means that she’s less prone to mould and that she can tolerate less optimal climates better than some other strains. Compared the original, Power Plant XL Auto has an increased amount of indica genetics which gives this variety some nice additional advantages. The indica side of her isn’t just responsible for her fast growth, it also makes her smoke awesomely relaxing. While she’s “only“ measuring about 15% of THC she is still potent enough to deliver a calming effect that will make you super-stoned in no time. Her intensive flavour blends sweet notes with awesome spicy and skunky flavours. Power Plant XL Autoflowering is as a perfect an auto as it can get. This is a highly reliable plant that you can grow pretty much everywhere without much fuss. Her excellent taste and the superbly balanced high sure won’t disappoint! If you require larger amounts of a highly-rewarding autoflower, Power Plant XL Autoflowering bulk seeds available in packs of 100 seeds can be an excellent choice.